Well, it is finally finished! Two years ago, I purchased a beautiful bag of Border Leicester/Cormo crossbred locks from Denise Curtis at Hoosier Hills Fiber Festival. Denise told me that this intriguing fleece came from a ram named Billy. 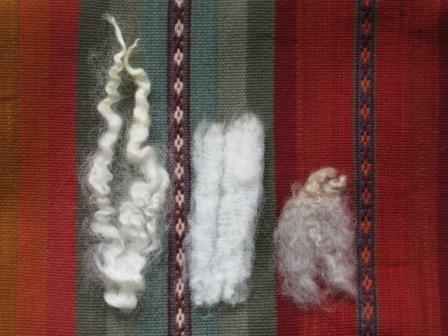 Crossing different breeds of sheep, a luster longwool like Border Leicester and a fine wool like Cormo in this case, can produce a huge variety of fleece types. Many of the crossbred lambs will look like one parent or the other, while others are somewhere in between. Billy seems to offer the best qualities of both of his parents. The locks are lustrous and silky, yet fairly fine and crimpy thanks to the Cormo. 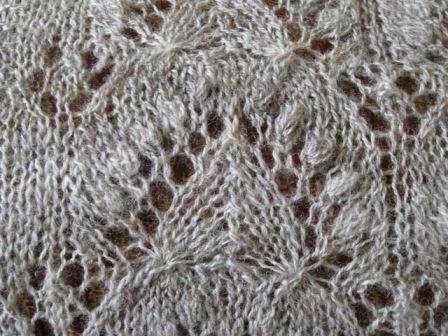 Handspun Estonian Lace—Queen Silvia Pattern from Knitted Lace of Estonia. I started by spinning samples on my Jensen Tina II and decided to comb and spin each lock into a worsted lace weight yarn. The gauge I settled on is a bit heavier than Estonian lace patterns typically use. My goal was for yarn to keep the crimp and loft that I loved so much in the lock. Some of my favourite yarns are those that are both durable and stable, yet keep the character of the unspun fiber. While this is a fairly bouncy, elastic wool, the air could be easily squeezed out of the yarn if spinning for a fine, smooth, crisp lace weight yarn. A smooth yarn would work well, too, but it was not what I wanted for this project. By the time I was ready to start knitting, I had made plans to join a tour of Estonia with Nancy Bush. The Queen Silvia is my favourite Estonian lace pattern and I began this project as I dreamed of all the lovely lace and mittens I would see on my trip. (Oh, the mittens! Story for another day.) I grabbed my trusty copy of Knitted Lace of Estonia (Nancy Bush, Interweave Press) and I was on my way. 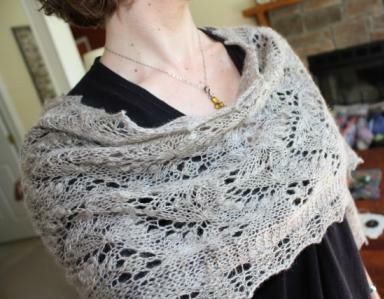 The only modification I made was to repeat the center chart only twice to make a smaller shawl. It was a fun project to knit and for another eighteen months, it was my indulgence knitting. You know, the kind of project you only work on when you really should be doing something else! Finally Finished and I love it! Hoosier Hills Fiber Festival starts tomorrow—I see a new bag of beautiful locks in my future!